I try to update the site as much as possible adding features that you guys want to see and fixing bugs that occasionally may crop up. So last week PUBG reset the xbox stats for the first time! We track your stats daily to build analytics and with this we can keep track of seasons. We released another new profile feature called seasons. You can see some breif stats on the previous and current seasons. Head over to the seasons hub to view more season data - Seasons Hub. The midweek outage should have fully recovered after PUBG's release messed up syncing stats with XBL. With the Xbox making it ever so easy for people to stream content on the web with the likes of Mixer and Twitch, we thought it would be nice to show gamers who are streaming PUBG now! 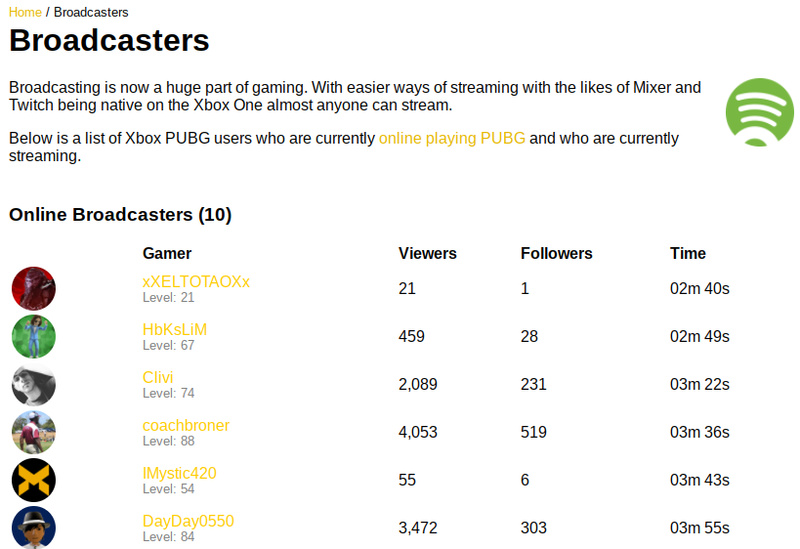 We created the broadcasters page which checks the online users if any of them are currently streaming. You can clcik there name to view there stream live on the site. PS - We fixed a bug where gamers avatars wouldnt display properly on the site! With the release of the latest PUBG Xbox patch they managed to break the process of syncing users stats with PUBG / Xbox Live servers. For roughly a 24-36 hour period all stats (Kills, Matches, Wins, Headshots etc) where lost. Stats tracking has now been fixed and is working as intended but anything gained during that time will not be recorded. This was a PUBG problem and nothing to do with our tracking. So this is a feature we've been trying to figure out how to do for a while. The idea is to track every PUBG game you play. We've got it up and running and have rolled it out to a few users to stress test it. We added a link to the Recent Matches section in the menu button - (Recent Matches). You can switch between winners and non-winners on the page. We will update you when the feature is available to everyone! Another new features is here! I know you guys love to record game clips and snap screenshots so why not have them all on here ? So, on every profile page you should see a link to Game Clips (Check out Bonxy&apos;s Clips). You can switch between clips and screenshots and also download them straight from our site. So today i added a new feature to the site. 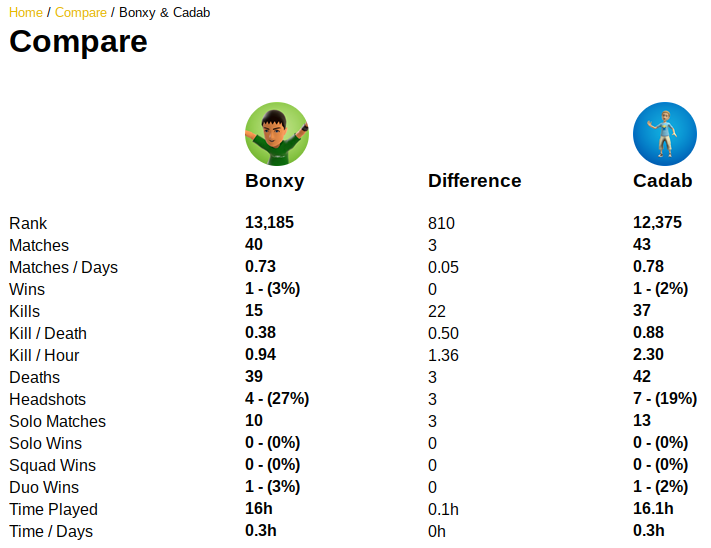 Plenty of you where asking for a comparison tool to compare yourself and other gamers. So now you can go to our new Compare Page, enter your friends gamertags and compare between each other. Check out Bonxy & Major Nelson if you like ? Just a quick update. There is a new domain! With the huge popularity the site has been getting i decided it needed its own unique domain! It has changed now to https://xboxpubg.com. 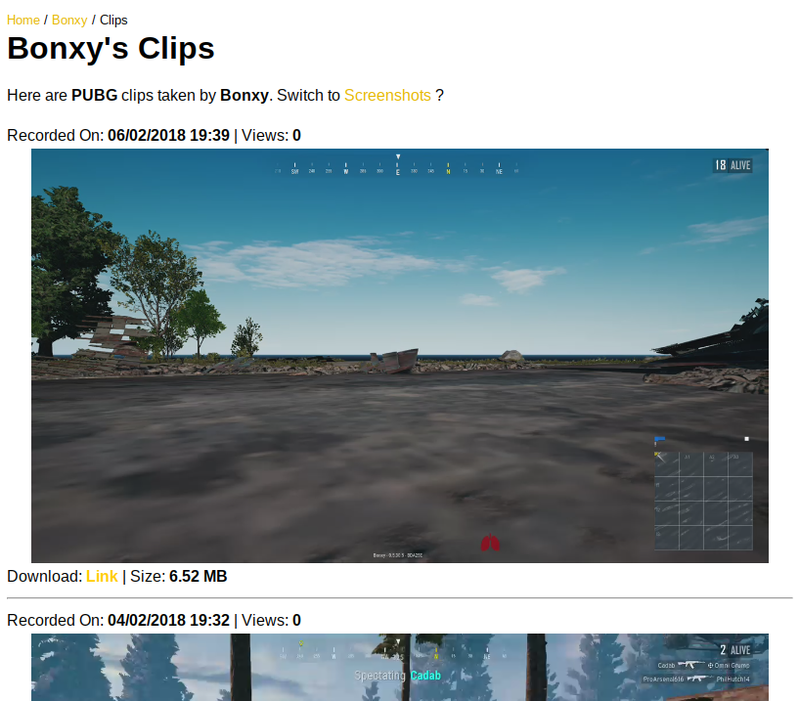 The old https://bonxystuff.com/pubg will still work forwarding to all the original pages. The scanner / site has been running for roughly 10 days now and the stats have been slowly building in the background. So im happy to say that the profiles pages are now available for everyone! Take a look at Bonxy&apos;s profile! 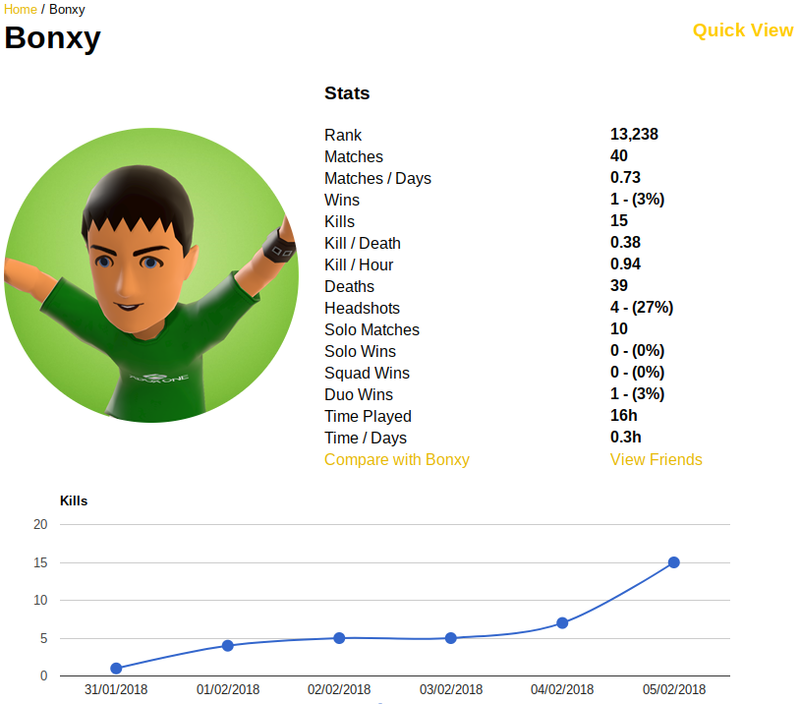 The new profiles show all your normal stats at the top but now show charts and graphs further down mapping out your peaks and lows for things such as kills, wins, K/D ratio and more. There is also a Friends section now. Simply go to your profile, if your xbox privacy settings allow, and you can now see all your friends. Check out Bonxy&apos;s! They are imported straight from Xbox Live. If a friend has played PUBG and is on our leaderboards they will appear on your friends list leaderboard.